The Masonry Institute of Iowa and King’s Material, Cedar Rapids, together with the National Concrete Masonry Association (NCMA), hosted their annual unit design competition at Iowa State University. Students in ISU architecture Lecturer Bo-Suk Hur’s ARCH 343/644: Building Science and Technology IV class participated in the competition as a class project earlier this spring. The goal of the competition is to design a new concrete masonry or hardscape unit that can be manufactured on a block machine or a big-board machine. The projects were judged with the following criteria: use of modular coordination, manufacturing efficiency, innovation, technical performance (potential stability, weathering resistance) and quality of craft and presentation (clear drawings, well-constructed prototype, graphic appeal, etc). Judges for the competition were ISU alumni David J. Nichols (BA 1985 / MArch 1988 Architecture), principal with Downing Architects, Bettendorf, and landscape architect Mark Slifka (BS 1982 Landscape Architecture) with Greenspace Associates, Bettendorf, along with King’s Material representative Jesse Borcher. “The students researched and proposed designs [which they] try to deviate from conventional concrete masonry unit construction methods and propose various architectural and structural possibilities,” said Hur. 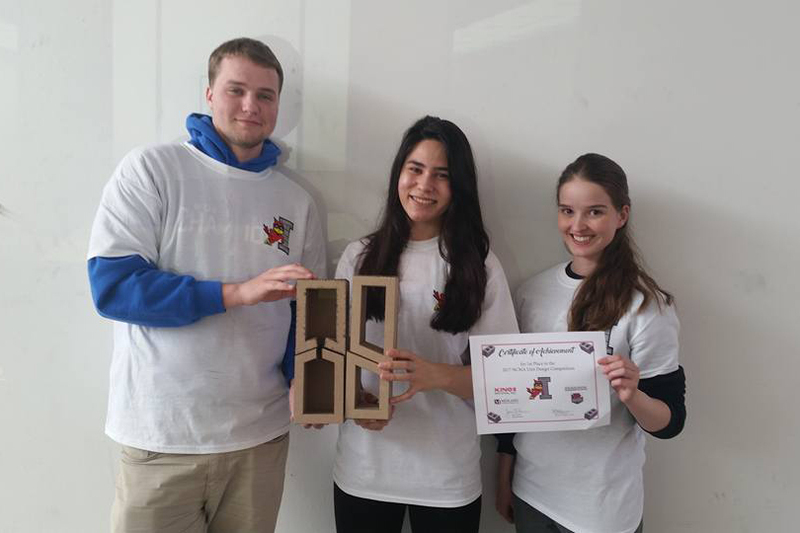 This year’s winning design is “Ampi Block.” Designed for both indoor and outdoor theater applications, this versatile four-piece block mold is applicable for sound enhancement by allowing for flat, angled surfaces and sound absorption. Sound absorption is facilitated with hollow spaces that can accommodate sound-absorbing foam, as well as electrical and lighting capabilities. The blocks can also be arranged to allow for seating and a stage. An entire theater can be built with this block mold. The first-place team received $250 in prize money, second place received $150 and third place received $100. Over the next few months Hur will work with the winning team to finalize their project and presentation to send on to the national competition this summer. The top three schools across the country will be invited to present at the NCMA Mid-Year Meeting in Toronto in August where the winning concrete masonry unit design will be announced. In 2015, ISU placed second overall.